American tastes dominated the world's automotive market for a century, but all that's changing now. Today it's the increasingly well-to-do Chinese car-buyer that industry wants to woo and win, thanks to this incredible fact— China has, over the last three months running, surpassed the U.S. in terms of volume sales of automobiles. Ever wonder why Ford's new Fiesta has an instrument panel that looks like a cell phone? Because that's what's familiar to its target audience of 20- and 30-something Chinese. It's also why Chinese versions of the Fiesta come in sedan size, with four doors, rather than as hatchbacks, which are anathema in the Middle Kingdom. The future of auto design was on display last week at the Shanghai Auto Show, where, in 30 football fields worth of space, international and domestic carmakers vied for the attention of Chinese consumers. The timing of the biennial event, China's oldest international auto show, was fortuitous. No one expected the Middle Kingdom to nab first place in the global auto market from America for at least another decade, but the financial crisis has had a sharp dampening effect on U.S. sales. The Chinese, meanwhile, spurred on by their government's enormous stimulus package, have kept spending. Beijing's 2009 auto sales target is 10 million units, an increase of 10 percent from 2008, and a figure that would cement its position, with an estimated 1 million more unit sales than the U.S. "No one expected China to emerge as the leading volume market this fast," says William Russo, a Beijing-based business consultant who specializes in the automotive sector. "This will give China a huge say in setting the standards and architecture for the entire industry." If Beijing gets its way, the future will be small, green and—of course—made in China. The shock of the global financial crisis, and the resulting need to stimulate the auto sector has persuaded Beijing to dig deep into government coffers with more than $733 million to promote the rural sales of small cars and trucks (which domestic makers specialize in) and $220 million to fund and upgrade new green automotive technologies that many consider to be the wave of the future for the industry. 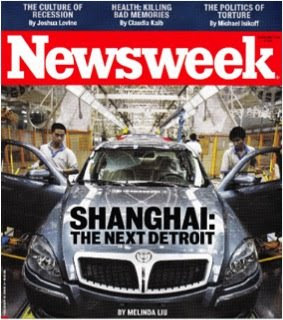 Ultimately, Chinese planners want to create a new Detroit—a leaner, meaner, cleaner global automotive hub. Bill Powell, at Time Magazine, captured up the mood at the Shanghai Auto Show this week brilliantly when he described Western car executives as "like drowning men grasping the only piece of buoyant driftwood in sight". China is the only major car market still growing in the world, and it could mean the difference between life or death for some of these companies. There's also been a lot of buzz that China is the place where electric cars will take off. Nick Reilly, the head of GM in Asia, said there was a "clear need" in Chinese cities for a small electrified car and that if the government handed out enough subsidies, "there could be very rapid sales growth". 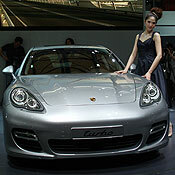 Chinese companies are obviously keen on the idea, and there were eight different electric cars on display in Shanghai. There's been a lot of hype about how companies such as BYD, which is 10pc-owned by Warren Buffett, has amazing battery technology that will help them lead the field. But the executives I spoke to were very skeptical. Despite the non-stop news coverage, BYD has only managed to sell 80 of its electrified hybrid cars since they went on sale last December, and many of those were to the Shenzhen government. Mr Reilly said that a closer look at the range and recharging abilities of the Chinese cars showed they weren't very different from technology elsewhere. What will make China the leader in electric cars, however, is the infrastructure. Again according to GM, China is already able to absorb the impact of a huge switchover to electric vehicles without much new investment. Kevin Wale, the former head of Vauxhall who now heads GM in China, said: "We are talking to the power grid, as are all car manufacturers who are interested in electric cars, and we don't think infrastructure is a major issue. The widespread distribution of electric cars can be more than covered by the existing power grid." On top of that, China is pouring money into new nuclear power stations, wind farms and hydroelectric dams to increase the share of electricity it produces cleanly. As Greenpeace says, an electric car is only as green as the electricity it runs on. Bill Russo, the president of Synergistics and the former head of Chrysler in Northeast Asia said China's strategy is straightforward: "1. China creates infrastructure first, 2. foreign brands bring electric vehicle technology to the largest market, 3. China "adapts" technology". It's not a new strategy, but it's been working for the Chinese car industry so far...have a look at this blog or this one. And the UK government might do well to learn from China's example before splashing its cash on subsidising electric vehicles rather than on the grid and power stations supporting them. Despite its struggles, General Motors is planning to increase its sales in China. Scott Tong reports from the Shanghai International Auto Show on why GM and other automakers are zooming to the Chinese market. Ford is showing off a cleaner transmission technology called Ecoboost. GM and Toyota display plug-in hybrids. But Bill Russo of consultancy Synergistics is watching the Chinese competition. Most major Chinese brands at the show are displaying their own alternative energy vehicles. And they have the financial backing of Beijing.